By the time I got around to photographing one of Santorini’s famed sunsets, I was thoroughly captivated by this small sliver of volcanic island. Everything about Santorini was enchanting — I was so charmed by the island that even after climbing flight after flight of narrow, cobbled stairs, I only wanted to see more. February 2017, single image, additional exposures for highlights, focal length 24mm, aperture f/11, shutter speed 1/3 second, ISO 64, tripod. I spent days exploring and photographing Oia’s blue-domed churches and its windmills, and marveling at the view over the deep blue of the Aegean. I photographed its iconic chalk-white churches and homes, made all the more striking against the blue of the sea and sky. But I hadn’t yet captured one of the island’s sunsets. Everyone knows Santorini for its famed blue and white churches, but it’s equally famous for its sunsets, so much so that crowds of tourists gather at certain points on the island for the best views. Oia, in particular, is regarded as one of best places on the island to watch the sun go down. In summer, which is the high tourist season in Santorini — finding a spot to oneself is all but impossible. I was there in the shoulder season, and still Oia was crowded with tourists who had the same objective as I did — to see those spectacular sunsets. 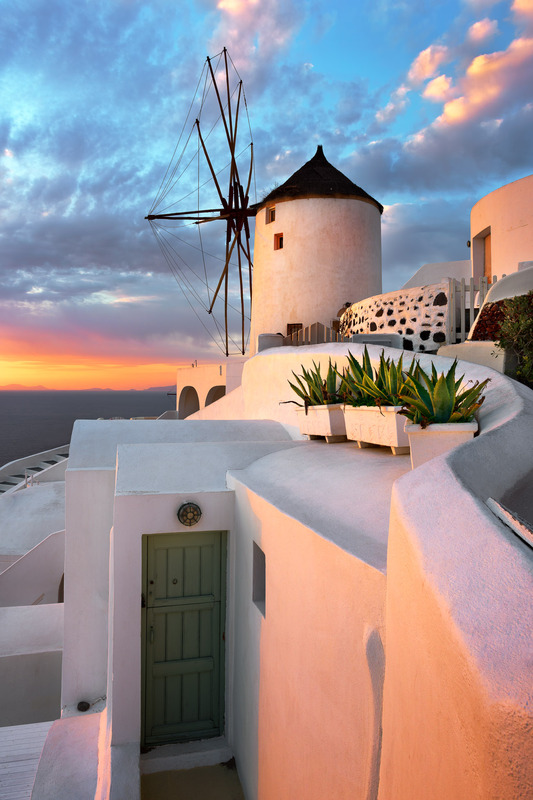 The windmills were a popular spot for sunset viewing, as was Oia Castle. I’ll admit that I went hoping to catch a few dreamy, golden hour moments to myself, and was disappointed to find that dozens of other people had the same idea. After lugging my tripod and cameras up Oia’s maze of stairs, I found a great view and got set up to capture the sunset. Plenty of other people had the same idea, but I knew they could be edited out of the photo if necessary. As the sun began to set over the Aegean, the crowds were momentarily hushed as they and I looked in awe at the one of the most breathtaking sunsets I’d ever seen. But then I happened to glance to my side — at Oia itself, and I realized that one of the most spectacular sights was in the other direction. As incredible as the sunset was, it left Oia’s whitewashed buildings glazed in a glowing, pastel light, and I thought the village had never looked lovelier. And while the crowds of tourists were mesmerized by the sea view, for a few moments, I had that watercolor-hued image to myself. This entry was posted in City and tagged Greece, Santorini.